Other One-of-a-Kind Accessories - allputtogether's JimdoPage! 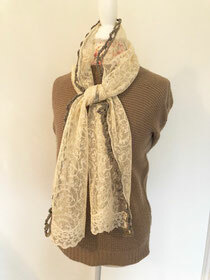 We make beautiful infinity and draped scarves from reclaimed curtains, draperies, lace, wool and vintage fabrics during the spring & summer and darling, warm reclaimed wool scarves with hand-cut appliques during the winter. We offer the widest selection of scarves in our new store and at our arts and crafts festivals. You can also purchase our scarves by clicking on this link to our online shop. We make fun and funky vintage pins using wonderful vintage fabric, men's silk neckties, vintage buttons and other great textiles. Our pins look especially fabulous on our vintage messenger bags made from pleated draperies and retro florals and geometrics. 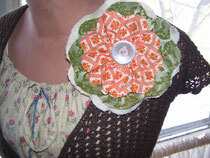 To purchase our one-of-a-kind pins, visit us at one of our favorite arts and crafts festivals. To view our current show schedule, click on the Upcoming Shows link on the left-hand toolbar. We make a wide range of beautiful, one-of-a-kind pillows using vintage upholstery fabrics in a variety of vintage & rustic styles. 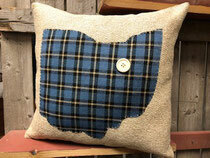 See our available pillows by clicking on this link to our online shop.